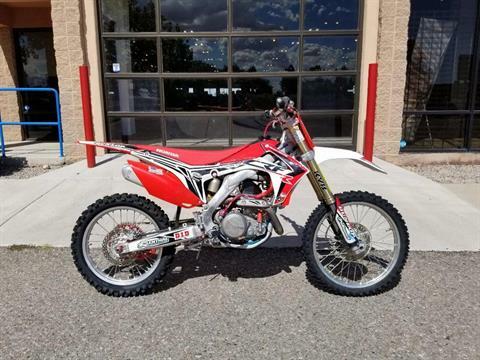 There Is No Second Place Riders and industry folk alike raved about the 2013 CRF®450R. And, we’ve given them even more to love. For 2014, there are new intake and exhaust ports, a new Dual-Timing PGM-FI fuel injection setup, and redesigned muffler internals to boost torque output and increase throttle response. 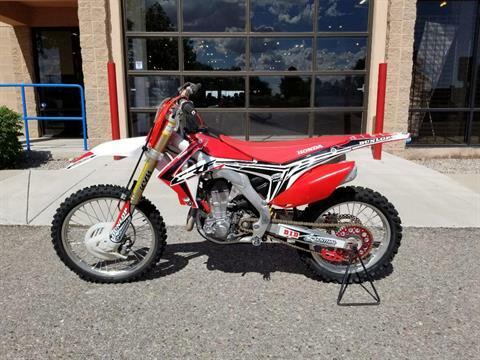 The CRF450R is designed for the way riders ride today. There’s more whipping, more scrubbing. So we built a bike that takes weight off the bike’s ends, and concentrates mass towards the bike’s center. The first thing you’ll notice is our revolutionary air fork. It’s nearly two pounds lighter than a conventional coil-spring fork, taking weight off the front. And now with improved oil flow, this year the fork is even more responsive, delivering even better handling. And new clutch springs to enhance lever feel. 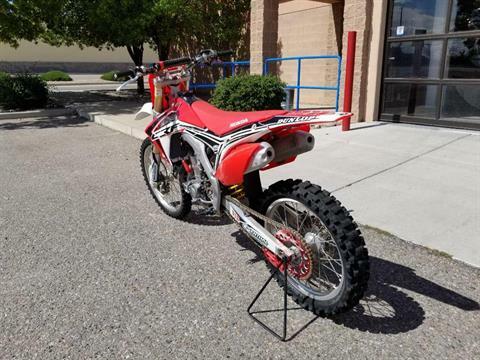 The CRF450R also sports a compact dual exhaust, tucked closely to the frame to further enhance mass centralization. And with better exhaust flow, we’ve even managed to increase horsepower. There’s also our next-generation aluminum chassis, designed to help lower the center of gravity. 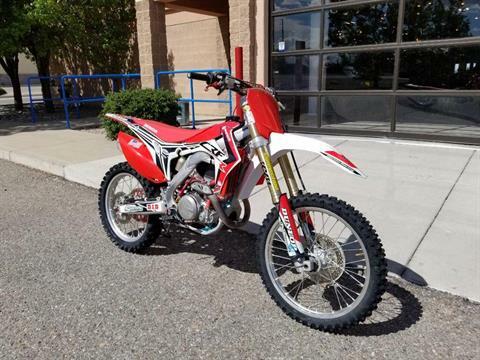 All in all, the 2014 CRF450R takes the best and lightest bike in its class and makes it even better. And, in doing so, plants itself firmly ahead of the pack. The Dunlop MX51FA Tires were made for the CRF450R. Literally. We even designed the suspension to work specifically with these premium tires. So you have optimum traction and control around the track. The settings on the CRF450R's Programmed Fuel Injection improve low- and mid-range performance, and help deliver smooth, predictable engine performance. And with our HRC Fuel Injection Setting Tool, it’s easily adjustable to specific track conditions. The air fork made waves in 2013. And we’ve made it even better this year. It’s a 48mm inverted KYB PSF (Pneumatic Spring Fork), easily adjustable with a simple air pump. And now with improved oil flow, it’s even more responsive, keeping your front tire planted for better tracking through turns and across whoops. New intake- and exhaust-port shapes work in conjunction with the new fuel-injection timing to give increased power and torque at partial throttle settings and more overrev, better suiting the CRF450R’s power delivery for most riders. Linking the front air fork and rear twin pipes is our Next-Gen twin spar aluminum chassis. The front spars are lower to work with the new fork. The subframe improves mass centralization. And overall, the bike has a lower center of gravity, so you get better steering feedback, suspension action and chassis stiffness and compliance. 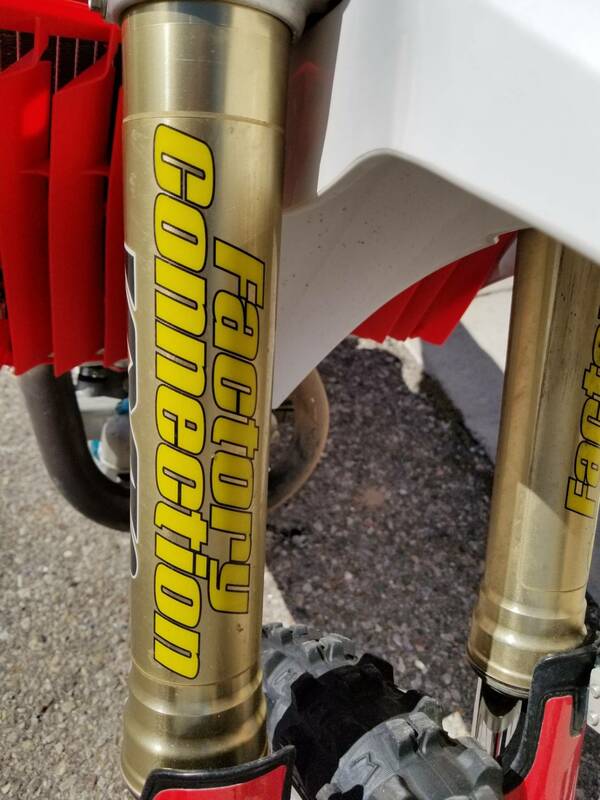 With a large-diameter sub piston, the CRF450R’s fully-adjustable rear suspension delivers improved low-speed damping for better traction and handling across all track conditions. To whip and scrub, the rider needs to move around the seat more. 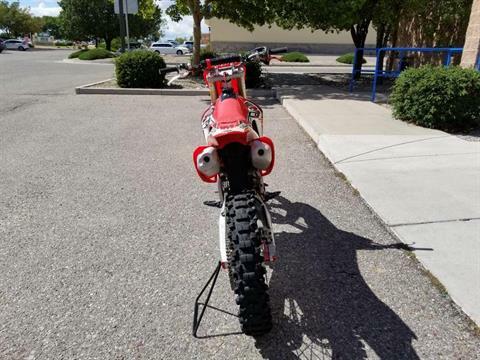 And the seat and bodywork on the CRF450R help make that happen. Riders fit easily on the bike, thanks to minimal bodywork. And they can slide around on the seat easier for better comfort and control. 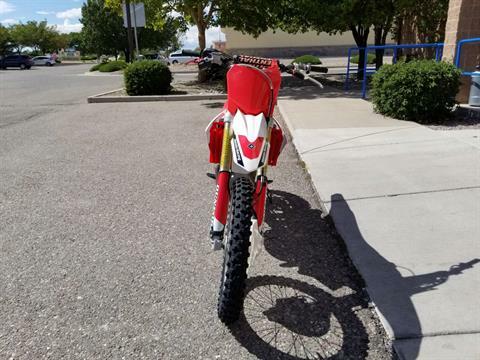 The dual exhaust on the 2014 CRF450R is compact and positioned closer and lower to the frame’s center. This reduces weight off the rear, bringing more mass to the bike’s center for improved “whipability.” And with by improving exhaust flow, we’ve increased overall horsepower. By moving the CRF450R’s twin pipes lower and closer to the bike’s center, the subframe needn’t support a long, extended exhaust. That means the subframe can be lighter overall. And with a wide opening at the top, it’s even easier to change the air filter. The CRF450R’s swingarm is specially designed to work with the updated rear suspension and Next-Gen chassis, delivering improved stability, traction and rider feedback. The 2014 CRF450R sports front and rear disc brakes with factory-spec master cylinders, and new rotor covers. You can wind down fast into turns, and get around the lap quicker.